On the menu for this weekend: fireworks and ice cream and bathroom renovations and picnics at the park and ice cream and - oh yeah - did I mention bathroom renovations? 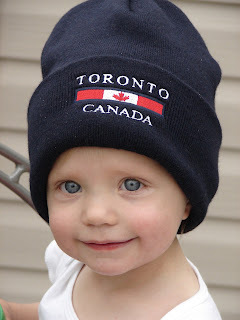 Nothing says Happy 140th Birthday, Canada! like ripping out your toilet and chucking it out onto your front drive. We'll be up to our elbows in drywall and tile and beer until Monday, at which point I will return here, to this place, to celebrate the empowerment of women in the blogosphere. And maybe wave a Canadian flag or two. In the meantime, the Canadians among you could help with the flag waving by going here and checking out a little project that the MBTers are embarking on, and if you're so inclined, weighing in with your two cents. Because changing the world starts at home. 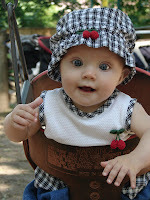 Sometime, over the past few days, over the past few weeks, over some period of time that I have lost track of, WonderBaby became a little girl. I don't know when or how it happened. It wasn't overnight; I would have noticed if she'd gone to bed a baby and awoken a girl. That is, at least, I think that I would have noticed. You would think that one would notice something so extraordinary as the transformation of one's baby into a child. You would think that one would notice the body unfolding from its coil of plushy arms and legs, of curvy belly and apple cheeks, into a soft-muscled miniature form of the whole person that it will become. You would think that you would notice, but you don't. My eyes only see my baby. My heart only registers her newness, her vulnerability, the extraordinary miracle of her having come-to-be. 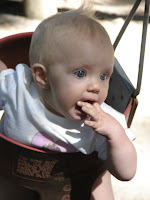 My daughter is, to me, still small and new and surprising. No matter how fierce, how fast, how powerful she demonstrates herself to be, she is still, to me, baby. And I am, to me, as a mother, still small and new and surprised. No matter how good at this I think I am still, to me, new. She and I, then, are - must be - baby and mommy. I cradle her, and she presses herself against me and holds on to me, for life, for dear life, and I can only feel her as baby. Soft, downy, fragrant, curvy. Even in the dead heat of summer, as damp tendrils of wispy hair become pressed, wet, like flowers, between her neck and my cheek, as rivulets of body-water, streaked with the dirt of the sandbox, run down between her warm round belly and my own, she is, to me, as sweet and new as spring. But, then, she pulls away and unfolds her long legs and demands her shoes. 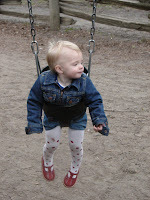 And then we walk, she and I, hand-in-hand to the park, where she breaks away and runs - speeds - to the slide, to the sawhorse, to her beloved swing (whing! whing! up mommy up! whing! 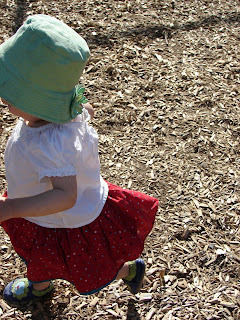 ), to the other children, running playing shrieking laughing breaking away. And I wonder, when did this happen? And, how did I not see it happening? How did I not notice the moment when she uncoiled, unfurled, flowered into this little human being, this tiny independent creature who runs so fast and so far and so assuredly and who returns only to grab my hand not for her own comfort but for mine? Now mommy come. Every day she flies higher, faster, further. 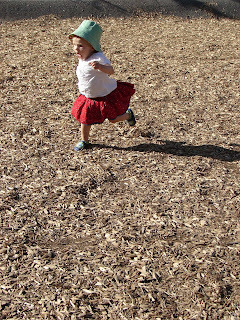 Every day I look on in amazement, blinking against the sun, the rush of air, as my baby, my wee baby, takes flight. Every day I am astonished. Every day I am surprised. Every day I whisper, softly, to myself: this is too fast. The carousel spins and the swing soars and she runs and runs and shrieks with glee, feeling only the wind in her hair, the exhilaration of flinging herself into this world. I see only the blur of the landscape of our life together as it speeds by. I squeeze my eyes together and I wish wish wish that it would slow down. "Anyone who decries environmental degradation, and who really cares about the state of our planet, should give some serious thought to not having children," wrote David Reeve. "Each additional person consumes a huge amount of resources over their lifetime, especially if they live an energy-intensive lifestyle such as we enjoy here in Canada... We can voluntarily cut down our population now, or do so under duress in the future." David Reeve isn't suggesting anything new. Organizations that promote "child-free" living as environmentally conscious have been pushing their message for a long time now. The planet is already over-populated, they say, and becoming more so every day. Anybody who has children just compounds that problem. We're full up here, people. No one else should be boarding the Good Ship Earth. Every extra body, the argument goes, is putting us at greater risk of capsizing. Specifically, every extra child puts us at greater risk of capsizing. But wouldn't it be correct to say, so does every body who insists upon living the full lifespan accorded by our Western standard of living? All those unproductive seniors, flying to Florida and tooling around on their golf carts, don't they put an unnecessary strain on the planet? Why are we keeping them around? If our boat is so crowded, why are we letting so many useless and burdensome people stay on? And, aren't we supposed to be protecting women and children first, not encouraging sterilization of the former and discouraging birth of the latter? And aren't children, like, small? Didn't we all get the message from Logan's Run? The only way to get things under control sustainably in a world threatened by over-population and depletion of limited resources is to kill off all the old people. We need children for renewal, for their youth and vigour and potential contribution to society. What do we need retirees for? And why stop at retirees? In Logan's Run, they killed off anyone over thirty (twenty-one in the novel upon which the movie was based). Thirty's a bit extreme, I think, but why not fifty? People over fifty are starting to slow down, starting to become burdens to society (especially, I might add, the childless oldsters, who have no families to shoulder part of the burden of their care.) Wouldn't it be more beneficial to the planet if human beings voluntarily jumped ship once they'd passed the peak of their usefulness? What? Does this sound like the ravings of a oldster-hater? No - I'm just being practical. I'm being environmentally conscious. I don't hate old people, I just hate that people make the choice to get old and become a burden to society and the environment when they could be sacrificing themselves for the good of the planet instead. It pains me to do this, but for the benefit of anybody out there without a clue, please read this before you hate-flame me. 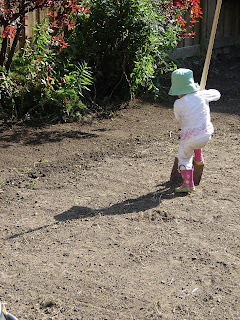 I do expect that you do all have a clue, but there were a disconcerting number of readers of my post on discipline and purloined ducks who really believed that I subject my toddler to the Ludovico Technique, and so I remain unconvinced of my own ability to make a satirical point. Personally, I like old people, except maybe not so much the ones - or anyone - who hate children and/or who think that sustaining legions of domestic housepets is somehow better for the world than raising good human beings. And, because I know that you are always yearning - striving - to be better than you are (you know, because to do otherwise would be bad for the planet and all), I thought that you might like to know about THIS safe and healthy alternative to culling the oldsters. I would have posted this weekend, but I was too busy quashing revolutionary activity - cat-jumping and ice-cream poaching and sleep-deprivation tactics and general sedition - in the toddler quadrant. 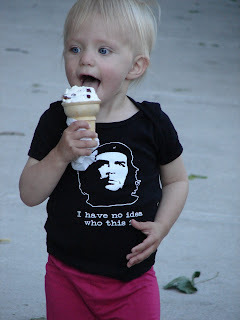 If all revolutionaries loved ice cream, Cuba might be a very different place right now. Then again, if revolutionaries loved ice cream, Ben & Jerry's might be a socialist republic under trade embargo. And then what would we do? While I'm busy playing Who's The Dictator with WonderBaby, you should go here and read what I did to oppress her this weekend (hint - it involved blue polyester). Also, you should go offer some advice in the Basement - it's much needed (hint - what would you do if your husband discovered he had another child?) Oh, and you may want to read the story and check the result of our BlogHer or Bust contest (hint - we couldn't send everyone to BlogHer, but everyone's getting candy) over at MBT. Round-ups of all the awesome posts will come once I've had some sleep. Unless I've been overthrown, of course, in which case you may never hear from me again (hint, hint - COME SAVE ME).